Come by our ART&FOOD Had restaurant located on the attractive tourist route between the National Theatre and Prague Castle in a quiet street in Prague's Újezd neighbourhood. 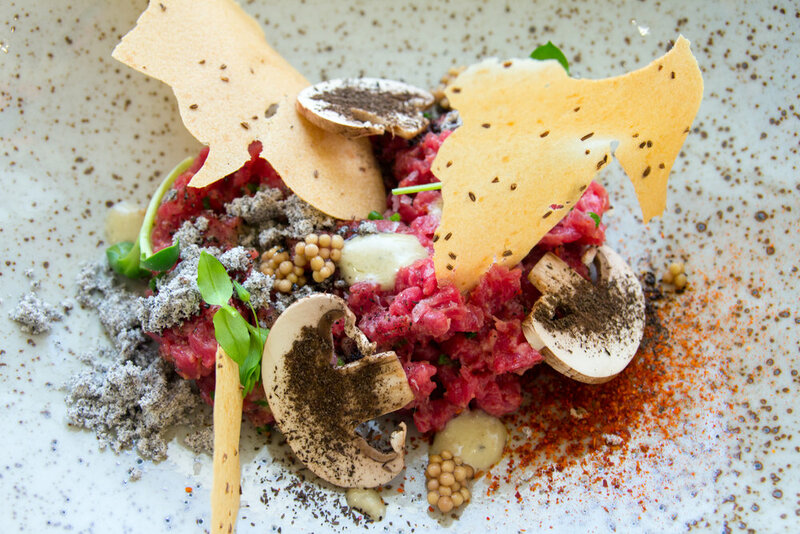 Relish every bite of our creative gastronomy: we base the menu around traditional Czech cuisine and fine wines from around the world which blend perfectly with dishes. Try the modern adaptation of original Czech recipes along with international cuisine. If you don’t want to miss out on beer in Prague, we have something special for you: about thirty types of exceptional beer by small Czech breweries. In case you fall in love with our products, you can get some of them directly in our restaurant just like at the farmer’s markets. You might also purchase a bottle of your favorite wine or beer to take away with a 40% to 50% discount. Our restaurant is a place where food, wine, art and music meet which gave us the best inspiration for choosing its name. We are also an original art gallery with more than two hundred contemporary pieces by leading Czech artists. Enjoy your meal among the fine paintings. We serve our à la carte menu from 12 noon: last orders at 11pm. We serve our degustation menu from 12 noon: last orders at 10pm. We serve our beer tasting menu from 11 noon: last orders at 7pm. Choose any six beers from about thirty kinds of craft beer by small Czech breweries and enjoy the traditional cuisine. On our menu you can find about thirty types of exceptional beer from prestigious local breweries. You can choose from more than one hundred and fifty kinds of wines from around the world. Our staff will gladly recommend the wine for the best pairing with your meal or we can choose a wine together based on your preferences. All the wines up to 2000 CZK per bottle can be sampled before being purchased just by the glass. We offer more than forty kinds of spirits. Our staff will gladly recommend a spirit based on your preferences. What do we care most about? The highest quality ingredients, maintaining superior friendly service and meeting the wishes of our kind food lovers. Our team organizes events of all sizes and styles from small, intimate sit-down dinners to lavish weddings and large corporate events for your clients. What can we do for you? Please feel free to send us an inquiry via email. From 7pm to 10pm you can enjoy live performances by local musicians. Call +420 605 555 050 or send us an email. If you would like to book a table for today then please call: online reservations are usually not preferred for the current day. For larger groups of six people or more please use email booking.